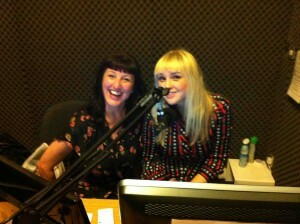 Hatty’s Silly Radio Show was so much fun to do. Hatty cracks me up. You can have a listen here – we talked a LOT about Vincent Price and his cooking prowess. 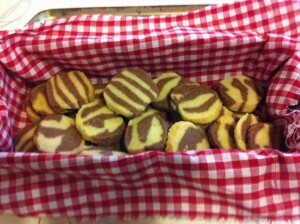 I took in some Vincent Price Brown and White Cookies as well as the aforementioned Pink Tonics. I was at my parents’ house in Suffolk the night before, and I knew I wouldn’t have time to go home beforehand so I made the dough in advance and then baked them in the morning before jumping on the train back to London. There were some comedy moments at my folks’ place. They were really making me laugh talking about the actor Dennis Price being an “uninvited guest” at their wedding reception. Here he is overseeing the cutting of the cake. Aren’t they a lovely looking couple? This photo is in a gorgeous leather bound album of wedding pictures and there is a great page of information at the beginning which has been filled in with details of what the bride was wearing, what colour the bridesmaids’ dresses were and where the happy couple went on honeymoon (Babbacombe, Devon). But my favourite bit of information was that the wedding reception was held in the Cuban Room of the Odeon Cinema in Romford. Fab. I want a wedding reception at the Cuban Room of a cinema! But only if it looks like it did in the 1950s. There was a great panoramic photo of family members with bride and groom and my mum told me all the names of the aunties and uncles. There was one man standing right next to her that she didn’t recognise. She handed it to my dad to see if he could work out who he was. My dad looked at the picture and yelled, “Who the hell is THAT? !’ It really made me laugh. 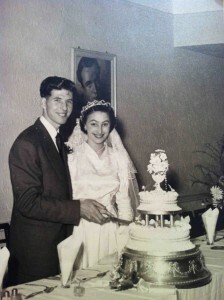 Mind you, as my parents have been married for over 60 years I guess it is hardly surprising that there is someone they can’t remember in their wedding party. Cream together the butter and sugar. Stir in salt and vanilla. Stir in flour, or enough to make a stiff dough. Cut dough in half and work cocoa into one half. 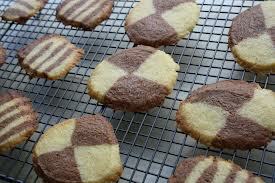 Shape half the vanilla dough and half the cocoa dough into long rolls about 1 inch thick, cut each in half crosswise. Place one chocolate and one vanilla roll close together on waxed paper, place second vanilla roll on top of chocolate and second chocolate roll on top of vanilla roll. Press together firmly. Warp in waxed paper or foil and chill for several hours or freeze until needed. Roll out remaining vanilla and chocolate doughs about ¼ inch thick. Cut each dough into 4 oblongs of identical size. Stack oblongs on top of one another, alternating colours. Press stack together firmly. Wrap in waxed paper or foil and chill for several hours or freeze until needed. To bake: Slice refrigerated or frozen dough into slices ¼ inch thick. Arrange slices on greased baking sheets, about 1 inch apart. 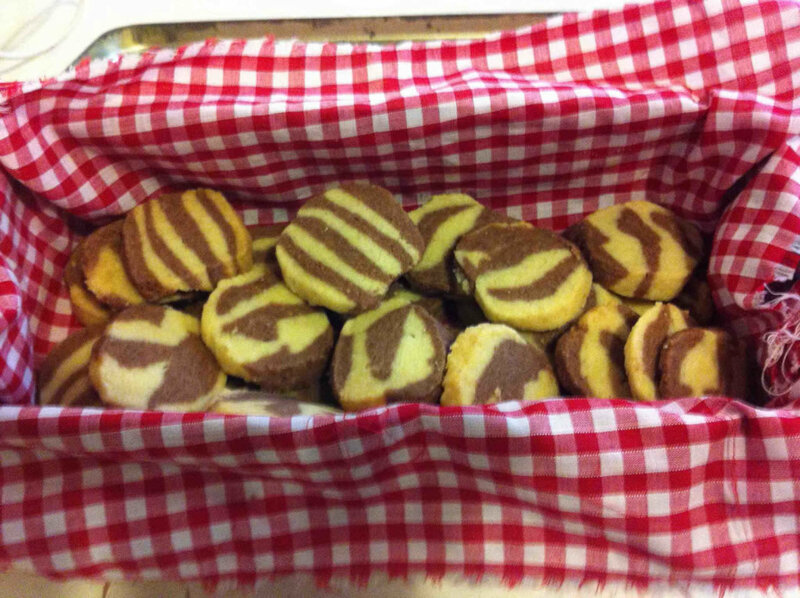 Bake in preheated 180 degrees C oven for 8 to 12 minutes. PS – If you have a fan oven you may need to have the temperature a little lower. I cooked mine a little longer than Vincent suggested – until they looked as though they were kinda dry. Probably about 15 minutes. They were very good. Here’s some I made earlier – to show you what the round ones should have looked like. 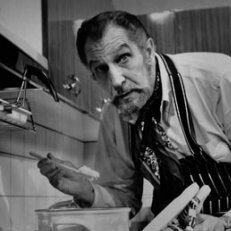 Thanks Vincent, we are all loving your recipes during this build up to the Vincent Price Halloween Cookalong! Which is TOMORROW – eek! Is that Mick McManus?!! You always prod the deep recesses of my memory! haha! Yes, indeed it is! I remember watching the wrestling with my grandad in the 1970s. I loved it. Maybe why I love roller derby too – the rough and tumble and fake aggression of it is fab.